Lee's Story comes three years after the end of Jesse's Story and five years after the end of Bran's Story. Dunaev, Bran's old master, has ruined another slave, and this time has dubbed him 'irreparable'. Meet Lee. He's terrified, catatonic, and even worse off than Bran was when Holden and Alix bought him from Dunaev. Reminded horribly of Bran, Holden begins to think seriously about the consequences of slavery and makes a decision that could have repercussions for his whole family. This book is a hell of a lot longer than the other two (like, five hundred and forty-five pages long), but I devoured it just the same. This one switches between Holden and Lee's points of view, which works quite well for the purposes of the story. It was interesting, especially, to read things from Holden's point of view. Holden has been a bit of a mystery in previous books, so it was really nice to get an insight into his mind. I decided early on in this book that him and Bran are both blind idiots, but I love them anyway. It was also really interesting to read about Holden trying to help and fix Lee when he wasn't physically attracted to him at all. He felt all paternal towards him, and I liked that these feelings were one of the things that triggered him thinking seriously about abolition. Valor really came into her own in this book. I mean, she's still an idiot and quite unlikeable, but she did a lot of growing up by the end of this book. I really enjoyed watching her journey, even if poor Holden didn't. 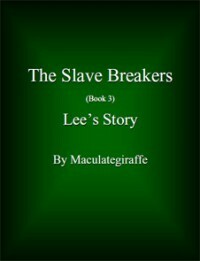 The characters continued to grow and develop in this one, and it was nice to see them all from Lee's fresh point of view. Especially Jer, I think. I have never shipped a couple so hard, and I wish the end was less ambiguous about them. Jer, staaay. It was intriguing reading what's basically a slave fic focused all around abolition. Especially when it actually made me feel conflicted about the whole argument. I mean, I'm against slavery in real life, but all I could think about was the consequences of abolition on the little family I'd grown to love. Puzzling. The time skips towards the end annoyed me, but I can see why they're necessary, and probably would have been less annoying in the original Livejournal form.